Ijen Crater is one of East Java‘s unsung gems. With a massive 20-kilometer-wide caldera filled with a picturesque turquoise-colored lake, Ijen is also the world’s largest acidic crater lake. Coupled with a breathtaking backdrop set at 2,799 meters above sea level and you have one of Indonesia’s most underrated postcard shots. 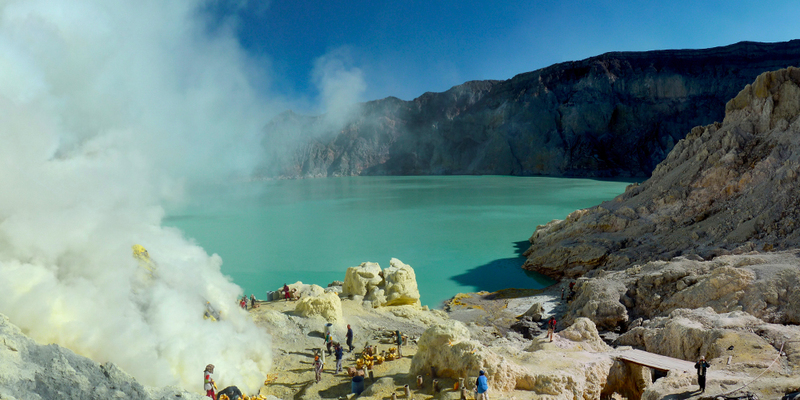 For those with more time, Ijen can also be combined with a visit to Mount Bromo and Surabaya. The main entry point to Ijen crater is the town of Bondowoso, which is about 5 hours’ drive from Surabaya airport. But with leg-stretching and snacking stops in between, it will more likely take you around 7 hours. After the long drive, keep your arrival day in Bondowoso easy. You may want to take an early rest and set your alarm for midnight departure from Bondowoso. The driving time from Bondowoso to Ijen crater is around 2 hours. If you want to catch the blue fire, you will have to start 11.30pm from Bondowoso, as the blue fire phenomenon typically occurs between 2-4am and the ticket counter only opens from 2am onwards (with a sizable queue of domestic tourists, so its better to start queuing earlier). If you prefer to get more sleep, you can choose to skip the blue fire section and depart at 2am from Bondowoso and start your ascent to Ijen crater at 4am for a sunrise hike. Or you can skip the sunrise altogether and do an early morning hike instead. It’s good to empty your bladder before you depart to Ijen as the toilet queue at the bottom of the crater can get really long and you can only do your business in the wild once you ascend. The entrance ticket costs IDR 150,0o0 on weekends and IDR 100,000 on weekdays. Ijen hiking can be attempted by most people, but you will need great stamina given the long distance which covers a 3km, steep climb that can reach 30-45 degrees in a gravelly sand structure. The first 2km is especially steep, with a canteen stop halfway for those who feel hungry, while the last 1km is relatively easy. Depending on how much rest stops you take, the hike to the top of the crater can take as fast as 1.5 hours or much more! When you take rest stops, remember to look up a lot: the night sky in Ijen is full of stars! 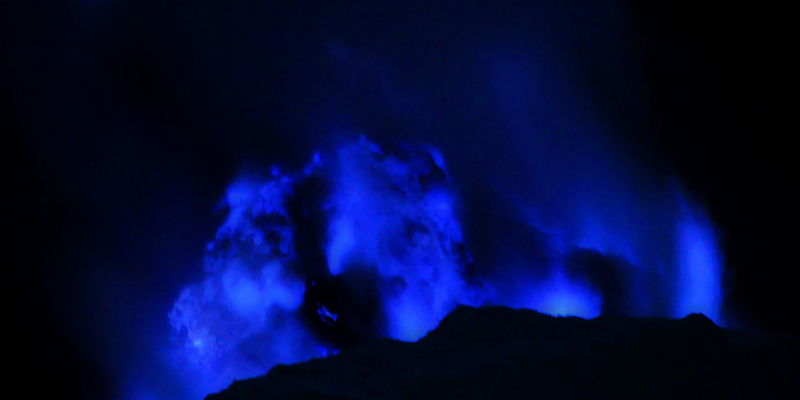 The dazzling, electric blue flames of Ijen is a unique phenomenon resulting from the combustion of sulphuric gases which emerge from the cracks of the crater at high pressures and temperatures. The gases sometimes condense into liquid sulphur which flows down the slopes and give it the seeming appearance of glowing blue lava. The blue fire is best observed between 2-4am, though you can still see it as late as 4.30am during late sunrise times in the dry season. You can observe the blue fire from afar at the top of the crater, but the blue fire will look very small, but you can still visibly observe it. Alternatively, you can also descend to the crater floor for an up close view of this surreal phenomenon. The descent to the crater floor is on narrow stairs of 600m and will take between 30-60 minutes depending on your speed and how crowded it is. It is important to note that you MUST wear a gas mask as protection against the dense and toxic sulphur dioxide. It is highly acidic so better be safe than sorry! If you are a fast hiker and you will reach the top of Ijen early enough, yet you should absolutely descend to the crater floor for the once-in-a-lifetime-experience. But it is also important to know the limits of your body well, so if it took you longer than expected for the first 3km ascent, then you should take a step back and admire the blue fire from afar, while stealing glances at the beauty of the star-lit skies above you. Depending on the time of year, sunrise can be as early as 4.30am (during rainy season) or as late as 5.15am (in the dry season). Watch the soft hues of orange and yellow light gradually emerge into a glorious dawn. If you are still on the crater floor, you can watch the unique spectacle of the crater spewing out yellowish liquid molten sulphur which is then collected by the miners. The miners will break the cooled sulphur into large pieces and carry them away with baskets, with loads as heavy as 90 kilograms! There are approximately 200 miners in the area, extracting as many as 14 tons of sulphurs daily. At around 6-7am, the morning mist gradually clears up and you will see the beauty of the tosca blue lake down under the crater. This is absolutely the best time to get your selfie stick out! Descending down the 2,799-meter-high Ijen is as beautiful as you’d expect, with a sea of clouds engulfing the mountainous topography and lush forested valleys down under. Keep at a reasonable pace as the tilted descent over gravelly sand can sometimes be slippery. Once you have reached the bottom, head back to your accommodation at Bondowoso and take a well-deserved sleep for the day. Late afternoon, once you wake up feeling more refreshed, pay a visit to Blawan Waterfalls. Located at the foothills of Ijen in the town of Bondowoso. The beautiful Blawan uniquely falls right underground like the Niagara Falls, which will continue all the way to Asembagus Situbondo. There is also a hot spring around the area, ideal for unwinding after the night trek. Head back to Surabaya for your flight home to Singapore. For those with longer time, you can either continue westwards to the iconic Mount Bromo (about 4-5 hours away from Ijen), or take a ferry crossing to the lesser explored, western part of Bali for more R&R via Banyuwangi (Banyuwangi is about 3 hours away from Ijen). Due to its distance, it is recommended to base yourself at the town of Bondowoso, well-situated within closest access to Surabaya airport to the crater itself. Accommodation standards in Bondowoso are VERY basic so you need to re-adjust your expectations. But once you remember that you’ll be spending your night hiking the crater and barely at the room itself, you don’t have to worry too much. Bondowoso Ijen Bamboo Homestay is the most value-for-money option, with English-speaking staff, free WiFi and they can also arrange airport shuttle at an additional charge. Rooms cost around SGD8 per night. Find rates and availability on HotelsCombined or Agoda. The closest accommodation to Ijen are Arabica Homestay and Catimor Homestay, both of which are subpar and only suitable for backpackers who don’t mind roughing it up. We usually do not recommend such accommodations, but for budget travelers who value proximity to the Ijen crater and would prefer to get a little more sleep, this is a possible alternative. The most popular gateway to Ijen is Surabaya’s Juanda International Airport. Singapore Airlines, Garuda Indonesia, AirAsia and Jetstar have several daily flights between Singapore and Surabaya from SGD$250-800 return. The flight lasts slightly less than 2.5 hours. From Surabaya airport to Ijen, the drive is around 7 hours. Surabaya is not the only entry point to Ijen. The nearest entry point is actually Banyuwangi’s Blimbingsari Airport, which serves domestic routes from Jakarta and Surabaya. However, its flight schedule is hardly compatible with flights from Singapore, to the extent that your transit time would most likely be even longer than the 7-hour drive from Surabaya, so unless you are already in Indonesia or the flight schedule changes in the future, the easiest way is to start from Surabaya. If you are already in the Western side of Bali, you can also consider taking a ferry from Gilimanuk to Ketapang. From Ketapang, Ijen is just about 3 hours drive away. Public transport infrastructure is not easy to navigate unless you are well-versed in Bahasa Indonesia, and given the long distances which you need to cover, you are better off engaging a local transport operator (by bus, the ride to Ijen can reach as long as 10 hours!). You can try Hadi Sumantri at haessumantri1983@gmail.com or +62 822 4441 4166 which offers one of the most affordable rates on the market and can also arrange guide and accommodation bookings. Ijen and Surabaya is 1 hour behind Singapore. June to August is dry season in Indonesia, and is thus the best time to visit Ijen. During rainy months, pathways can sometimes get slippery. This is also the time of the year when sunrise is slightly later at around 5.15am, allowing you more time to summit and descend to observe the blue fire. During the rainy season, sunrise can start as early as 4.30am! Dress in layers and carry gloves. Weather in Ijen can get really cold, but due to the steep climb, at times you may also feel warm. Good hiking shoes will help you get a better grip of the steep hike to Ijen. Torchlight and spare batteries are crucial if you want to see the sunrise or blue fire. A gas mask is needed due to the volcanic smoke from Ijen which can be poisonous. You can also rent a gas mask at the entrance to Ijen crater for approximately IDR50,000 or pre-agreed the rate with your land tour operator. Goggles can be considered for eye protection against the volcanic smoke. A raincoat can be useful in case it rains in the middle of the hike. Hiking poles can come in handy, but are not compulsory. DSLR/mirrorless camera with tripod for those who want to photograph the blue fire and the magnificent starlit skies of Ijen crater.